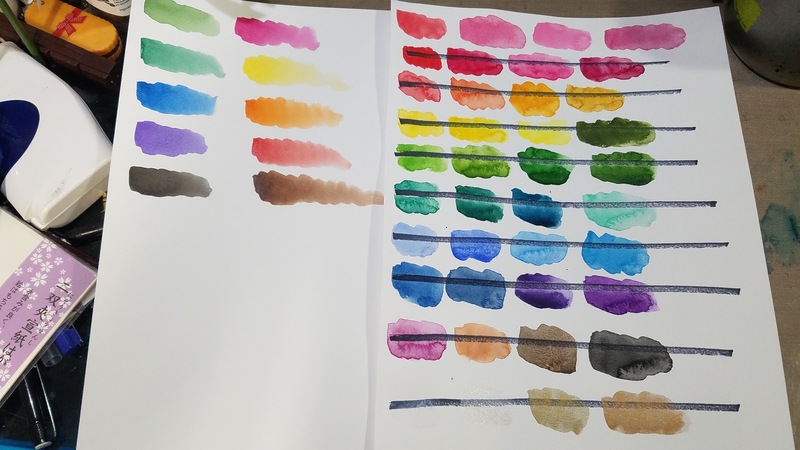 In 2014 and 2015, the scrapbooking community was all aflutter over Kuretake's Gansai Tambi watercolors. Inexpensive! Large Pans! Vibrant colors! Inexpensive! Easy to use! Inexpensive! They've since moved on to other obsessions- Artist Loft watercolors, handlettering, Sharpie Liquid markers- how quickly time moves. 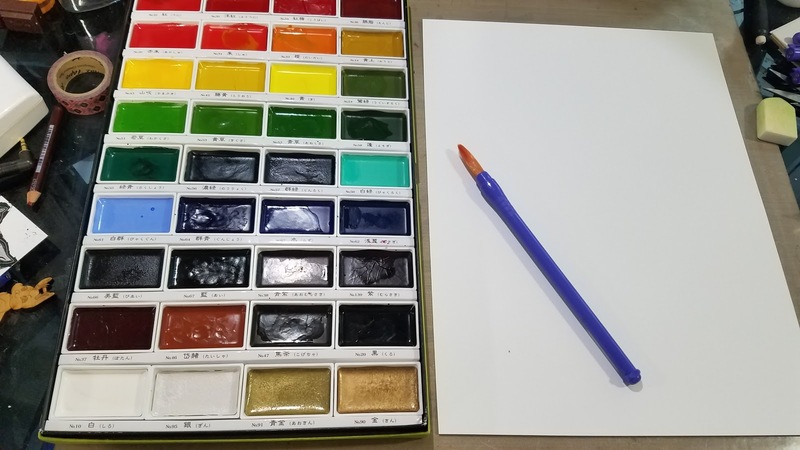 But Kuretake's Gansai Tambi watercolors are still interesting, affordable, and vibrant, and for the right type of watercolorist, they may be a perfect addition to your studio or supply hoard. 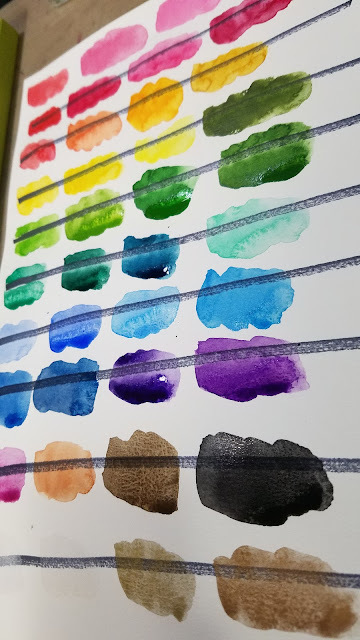 Back in December 2015, my friend Heidi Black sent me this beautiful set of Kuretake Gansai Tambi watercolors. 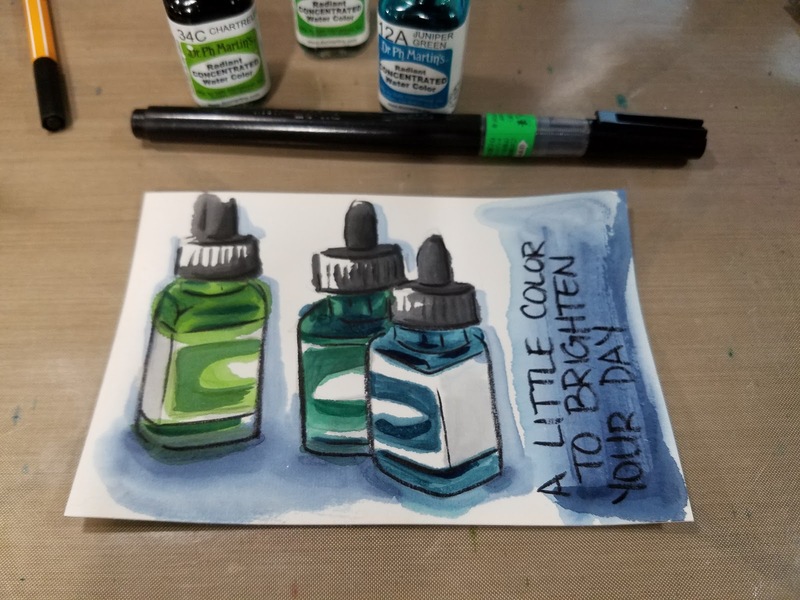 A watercolorist and comic artist herself, Heidi and I have long shared a passion for beautiful art supplies, and she's written many guest posts for this blog over the years. Unfortunately, sometimes I can be slow- juggling freelance illustration, illustrating my own comics, pursuing longterm employment opportunities, traveling all over the country for conventions, and launching a Youtube channel can make prioritizing art supply reviews difficult sometimes, so I didn't get to these wonderful watercolors until January 2016. And then, somehow, another year flew by me, and here it is, August of 2017, and I'm finally writing about Kuretake Gansai Tambi watercolors. Available in sets- 12, 18, 24, and 36 pans, in this style of packaging. 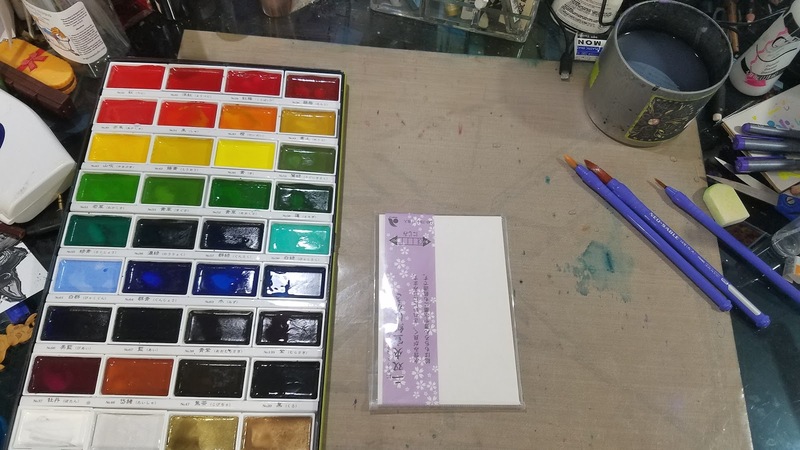 There's a small 12 set of traditional colors available from Kuretake as well, and a 6 color gift set. Apparently, this variation of the Kuretake Gansai Tambi did not do well in Japan, so if you're ordering Japanese stock, it tends to be old stock that lacks the protective faceplate. 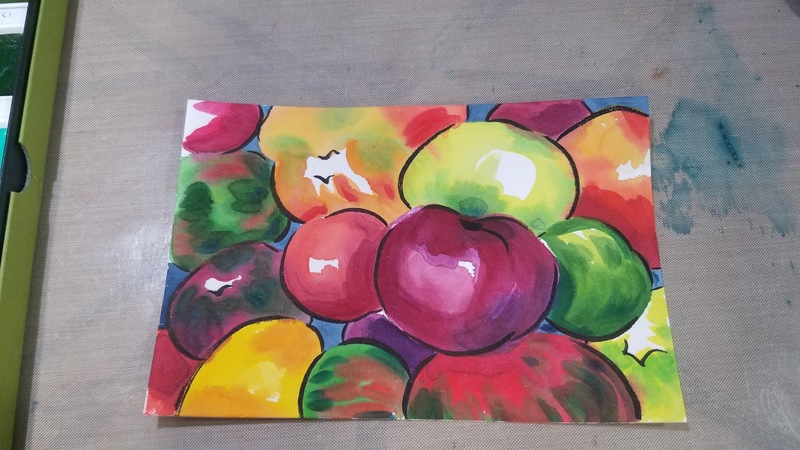 Apparently those cakes may arrive crumbled or cracked- any watercolorist knows that that's mainly a cosmetic flaw and can be easily remedied, however I would not pay US market price for damaged goods. The Western market variation for the UK and North America, is fresher stock, as it's fairly popular over here, and will come with the face plate. If you buy from an authorized Kuretake Zig dealer, you'll get the Western variation. All sets of Gansai Tambi come in a lovely green box with gold foil embossing, and Western versions will have a belly band in English. The package is wrapped in cellophane, and closed with a simple piece of tape. Please create a colour chart by painting the colour onto the chart on the back side of a lid. Inside, the colors are organized in four columns of nine pans. Inside the lid is a fill it out yourself swatch chart, to help you keep track of your colors. 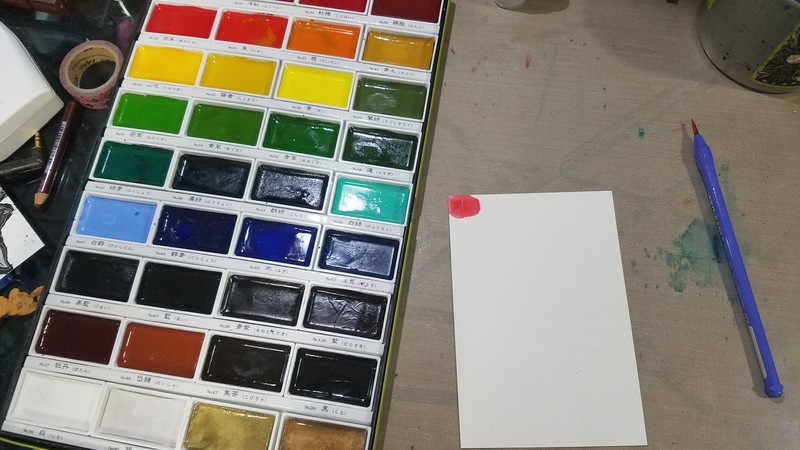 If you so desire, you can also write the color name, but I find color names to be arbitrary when you have a swatch to refer to. Inside the lid is the protective shield I mentioned earlier- I recommend you keep this- it can be used as a makeshift palette in a pinch, and will help keep your pans in place. 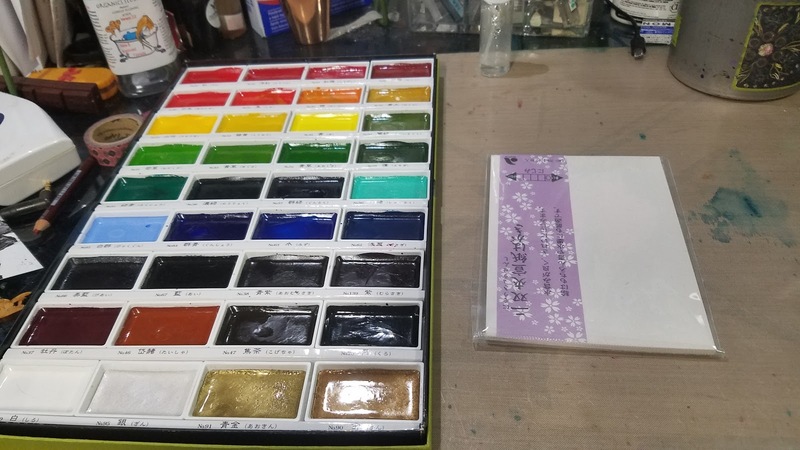 Inside the palette, there's nothing to keep the large watercolor pans stationary. If you so desire, you could use a bit of double stick tape or washi tape to tape them into place to prevent shifting in transit. 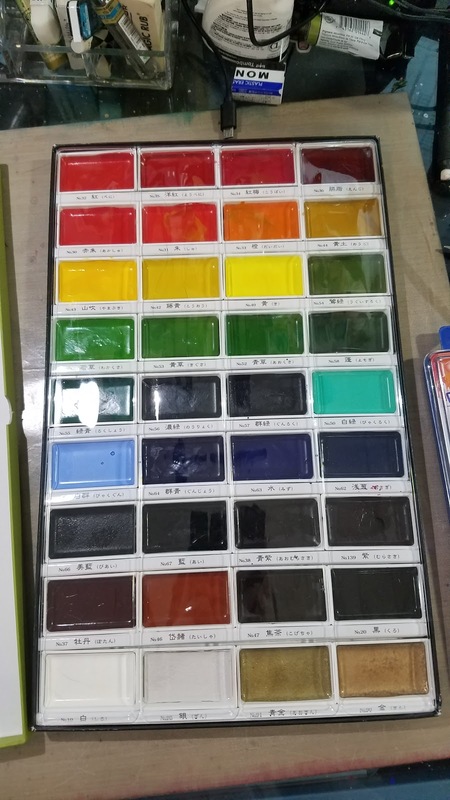 Inside the palette, there are small cardboard dividers that also list the color number and name. While atmospheric, the yellow lighting does nothing to show how vibrant these watercolors are in their pans. Let me remedy that under some 'natural light' lamps. With the protective cover on, holding the paints in place. Whabam! 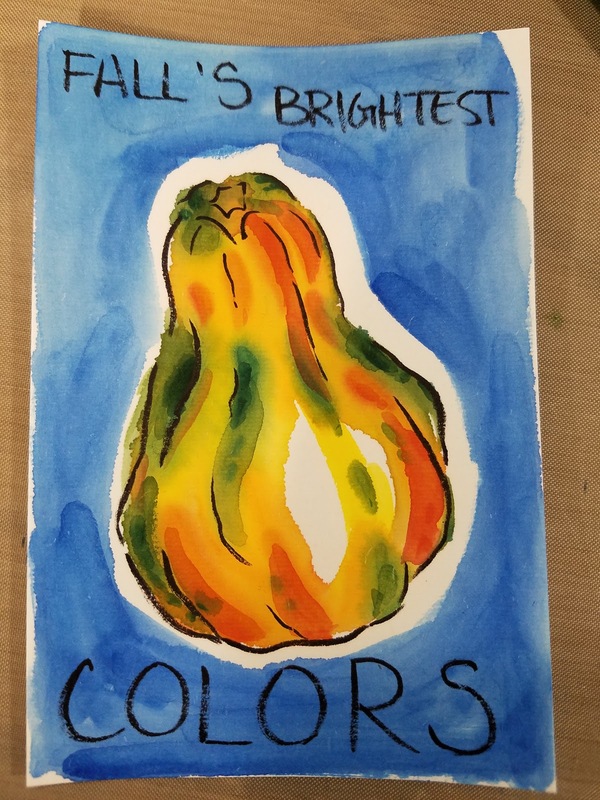 These are definitely showy watercolors! Which is conveniently also printed on the back of the pan. When swatching, I dropped a droplet of water into each pan and allowed it to activate the pigments for a moment. 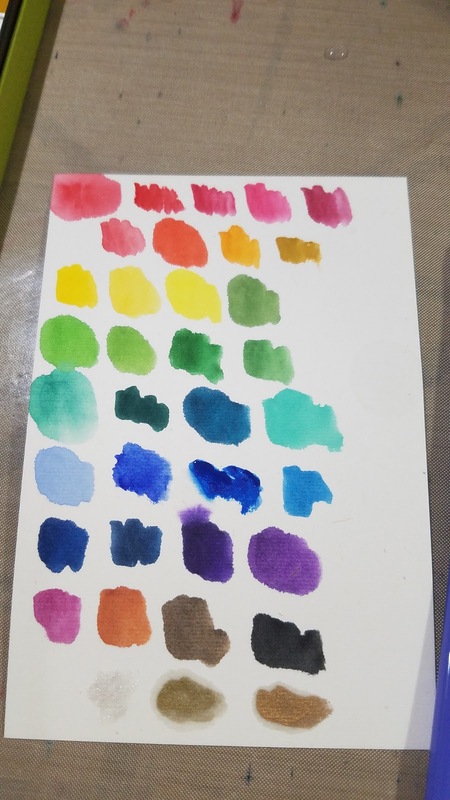 I then used a waterbrush to swatch each color, cleaning the brush between swatches. Swatches were applied with a Pentel Neo Sable synthetic sumi brush. 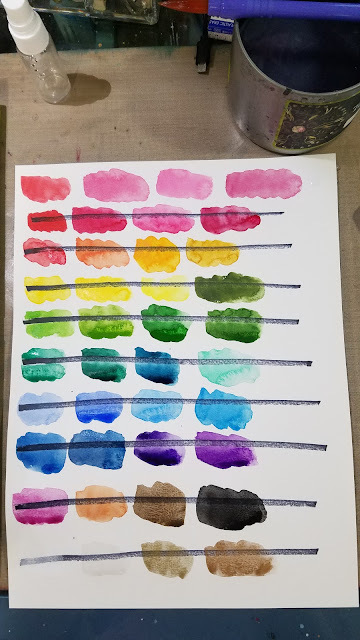 If I use the same water to paint ratio as I would for Western style watercolor paper, you can see that the washi based etegami paper blobs and bleeds out. To effectively use etegami paper, you need to greatly reduce the amount of water you would normally use. 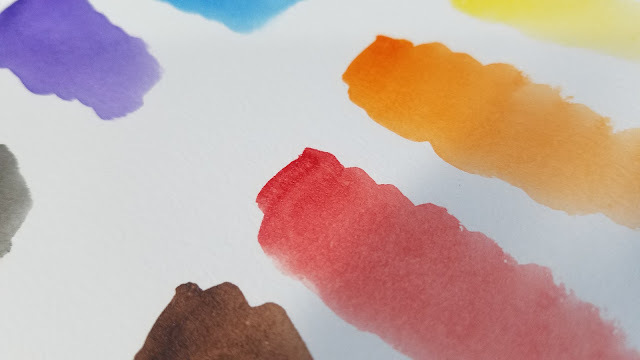 Because these paints are often so glossy smooth and perfectly poured, Gansai Tambi paints remind me of student watercolors. 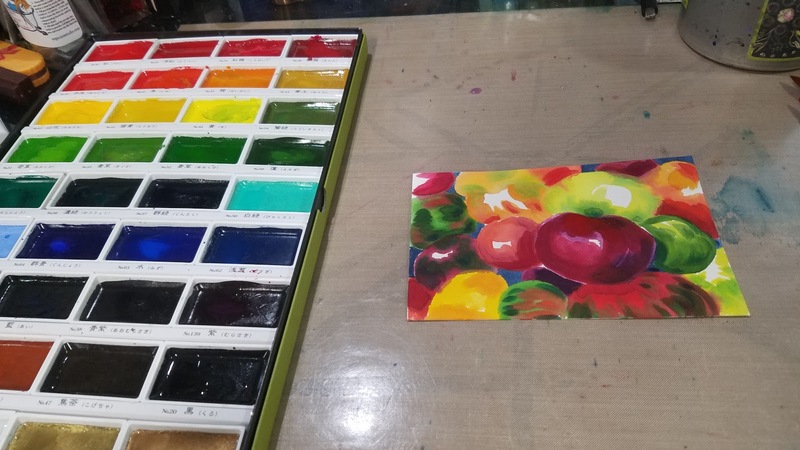 And in a way, they are similar, because both perform quite differently from what Western watercolor artists expect from professional grade watercolors. As you can see, the whole pan is about a third of the size of the Gansai Tambi pan. Secondly, this paint goes fast- the high glycerin content means you need more paint to get the color you want. 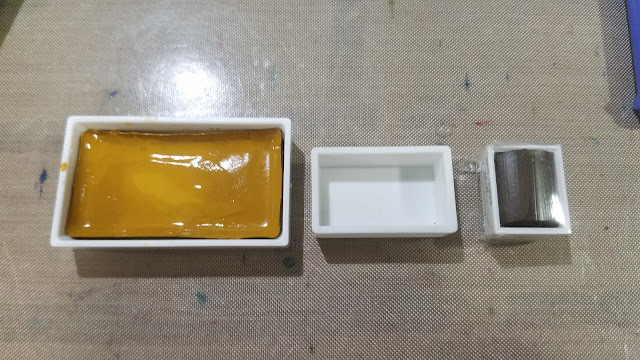 So while you might think you're getting a real steal with these huge Gansai Tambi pans, you're probably getting a little less than you would from a full size Western watercolor pan, especially if you're using a nicer brand. These large pans are actually designed to facilitate large sumi brushes, or larger waterbrushes- plenty of room to swish and swirl up some color. And Western pans just aren't quite big enough to cut it. Now of course, I've reviewed loads of affordable (cheap) art supplies over the years, so I know the difference between children's watercolor palettes and a palette designed for artists. However, the way many crafters handle the Gansai Tambi watercolors, they might be just as well served with a good set of children's watercolors- loads of color, very inexpensive, easy to replace. 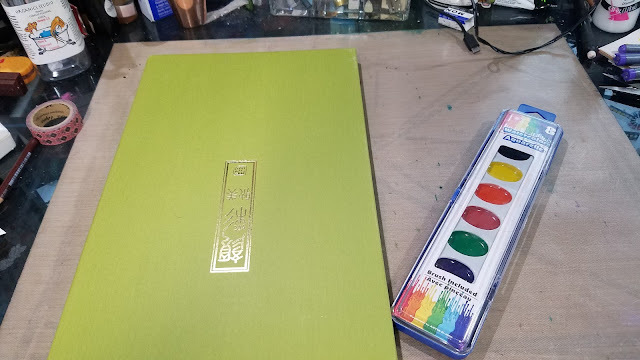 I've heard excellent things about Yarka's student watercolors, and recently acquired a small set, so I'll report back soon. That's not to say Gansai Tambi aren't worthwhile, or even to insinuate subpar performance. 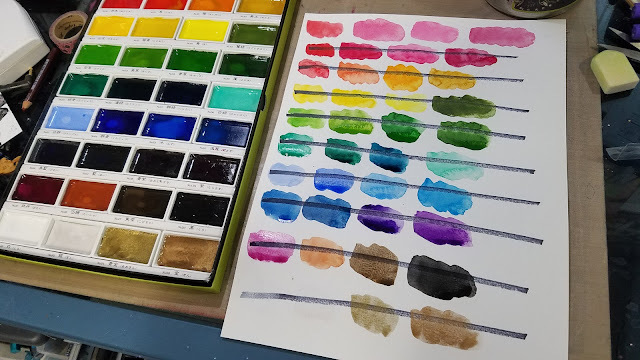 Its just to say that if you don't intend to layer, wash, or really work your watercolors, and you don't need archival qualities, there's no need to spend a lot of money on watercolors, even on comparatively cheap watercolors like the Kuretake Gansai Tambi. Help fund future reviews and tutorials by joining the Artnerd community over on Patreon! 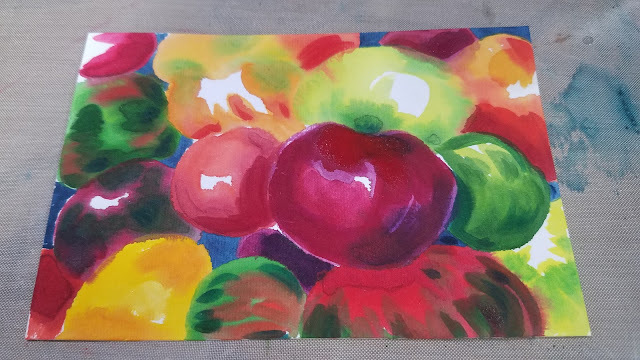 Love art supply reviews? 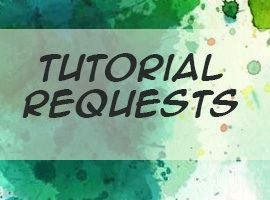 Enjoy art tutorials? My Artnerds help fund my work here and on Youtube. 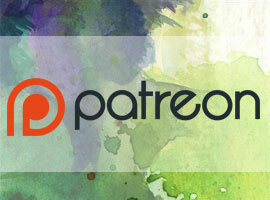 For as little as $1 a month, you can support what I'm doing here, and gain early access to popular product reviews and tutorials, backer exclusive videos, free comics, and art assets. 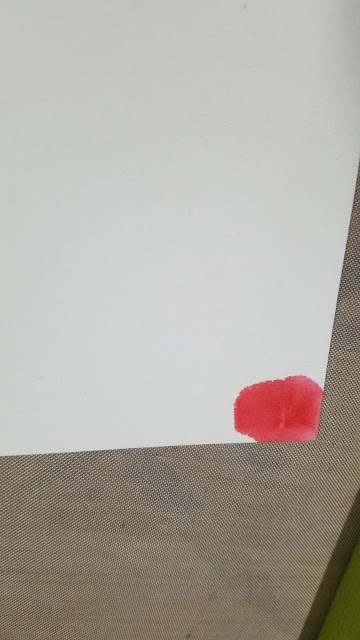 A lot of the reviews I watched and read contained complaints about these paints arriving cracked. That's a cosmetic issue, and does not effect the quality of the paints. This can happen for a few reasons, but what I suspect is that the paints get a bit too dry in storage and in shipping. 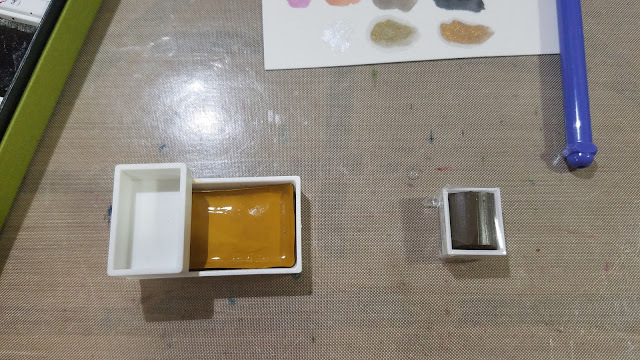 If you really need your paints to appear mirror smooth either A: don't use them or B: you can add a little glycerin back into your paints. 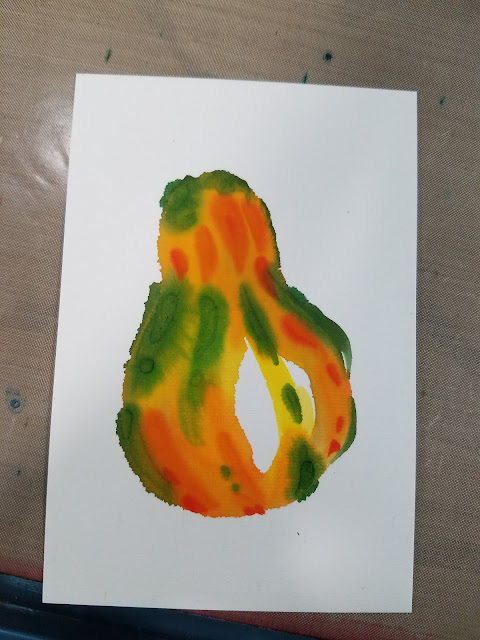 This test was completed on a block of Arches Rough press 140lb watercolor paper, which is a cotton rag paper that's highly regarded among watercolor artists. This illustration of Kara, the main character from my watercolor comic, 7" Kara, was inked with the waterproof Sailor Mitsuo Aida brushpen, which I reviewed in 2015. When approaching this field test, I approached it the way I would with any set of Western style watercolors. My apologies for the terrible lighting in these photos- I was out of town at the time. First a very diluted wash of light blue is applied. I used a small plastic welled palette to mix individual colors such as the background wash and skintones. And working wet into wet, I dabbed yellow into the blue background, then dabbed around it. Even watered down, the colors in the Gansai Tambi palette are vibrant and saturated, and can build in intensity. Colors go down super vibrant and saturated, and dry only slightly less vibrant. The top of Kara's hair is still wet, the bottom has started to dry. And since the lighting in these shots was so warm it threw the color balance, I took my finished piece outside for more accurate photography. Can't stand a cliffhanger? Prefer a physical book? Order your copy from the Nattoshop today! 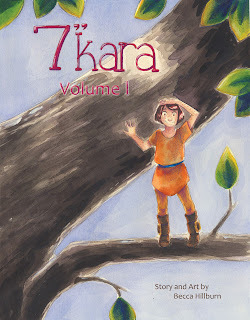 7" Kara follows the adorable adventures of Lilliputian eleven year old Kara as she explores the yard outside her house. Full of friendship and big adventure, 7" Kara is a comic you can share with the whole family. So after doing more research, I realized that Gansai watercolors are a whole category of paint, typically used for Etegami postcards. 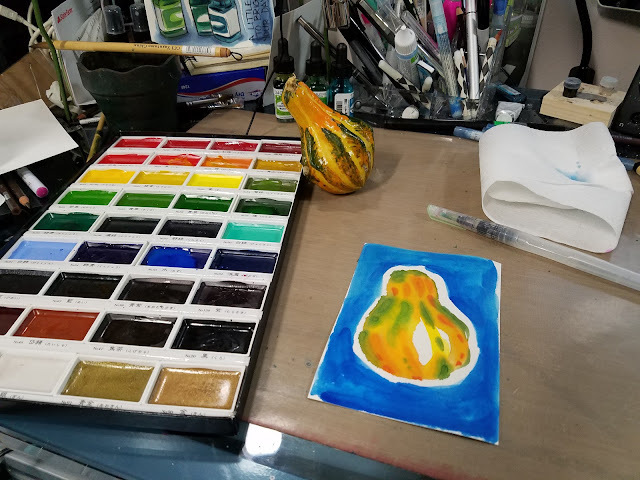 In October, I wrote a post about Akashiya's Niso-Kyosen Etegami paper, and included a tutorial for painting etegami postcards, a tutorial that utilized these Kuretake Gansai Tambi watercolors. This post was inspired by an anecdote shared with me by a friend who works in art supply customer service- a customer wrote in to their company, irate that etegami watercolor paper does not behave 'as expected' (like Western watercolor paper). This complaint matched my original feelings for Kuretake's Gansai Tambi watercolors, which did not handle as I had expected they would, and I decided to check out Gansai Tambi watercolors in their intended context- as watercolor for etegami postcards. I highly recommend you check that post out, and enjoy these illustrations from that post. Basically, most etegami papers are made of washi, and are designed to wick water out and bleed. 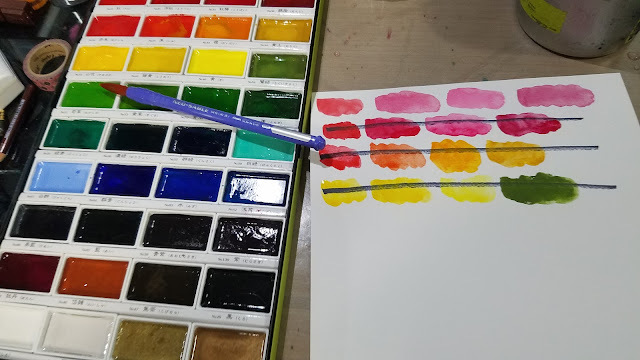 So proper use of these watercolor paints means carefully controlling when you want huge bleeds and when you want super saturated color. 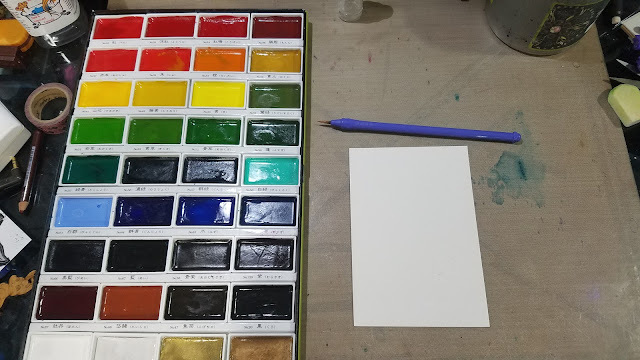 Etegami watercolor paper handles very differently from western watercolor papers, and gansai tambi watercolors are designed to activate quickly and go on thickly. If you're interested in learning more about gansai tambi as a category of paint, I can't recommend Sadie Saves the Day's video on Gansai Tambi enough. She explains the differences between Western paints and watercolors like Gansai, including composition and handling. The large pans really facilitate getting larger brushes, such as sumi brushes, into the paint and picking up a uniform amount of color. For etegami postcards, which benefit from wet into wet blurred blending, the large set of available colors is extremely handy, as I don't have to stop to mix colors ahead of time, and can allow the colors to mix on the page. This allowed me to crank out to beautiful etegami postcards quickly. Some of the colors that I'd NEVER use for western painting ended up being ideal for etegami paper. But just because a material is designed for one use doesn't mean it can't be appropriated for other uses. As always, I encourage you guys to explore art supplies, to try new things, but doing your research before dismissing a difficult medium can make a huge difference in your growth as an artist. Do I think Kuretake's Gansai Tambi watercolors are the end all, be all to inexpensive watercolor? 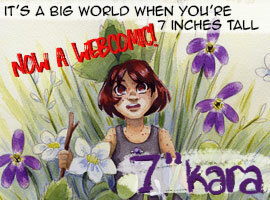 Nattosoup Studio Art and Process Blog is a proud affiliate of Ink Drop Cafe, a comic collective. If you enjoy beautiful art and love webcomics, make sure you check out what Ink Drop Cafe has to offer. 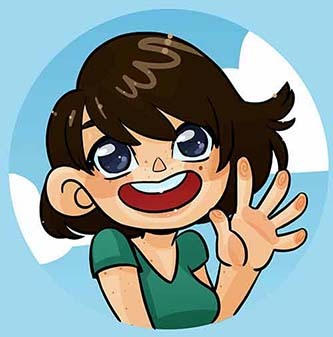 From wonderful webcomics to amazing artist resources, Ink Drop Cafe has you covered! 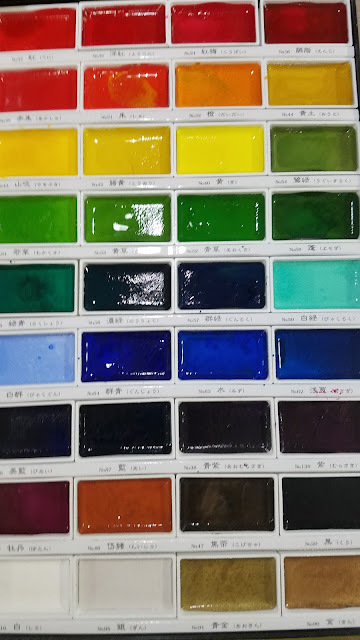 Kuretake Gansai Tambi watercolors are beautiful, brilliant watercolors with a fairly high glycerin content. This isn't noticable when used on etegami paper, but may build up on Western watercolor papers, including cotton rag papers like Arches. 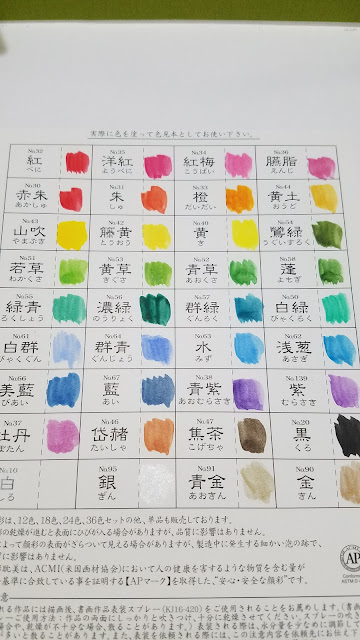 Who are Kuretake Gansai Tambi watercolors for? For those interested in exploring other types of watercolor, including etegami postcards? 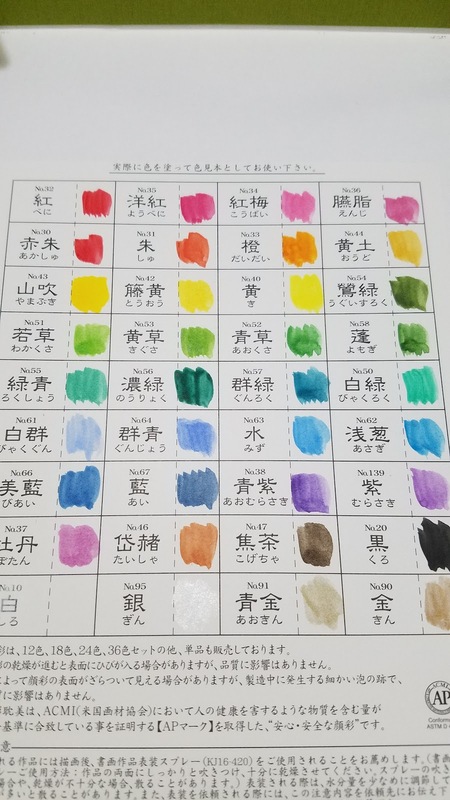 Are Kuretake Gansai Tambi more opaque than other types of watercolor? Western style waters have opaque colors too, like Yellow Ochre and Venetian Red. 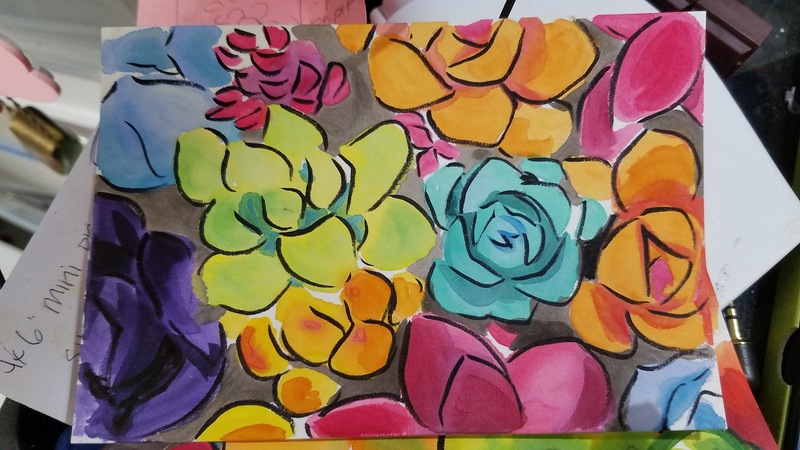 These watercolors followed a similar pattern in opacity. And of course, when you apply ANY watercolor very thickly, they will be slightly opaque. The high glycerin content of these watercolors means they activate fast, and go on thickly. It also means you'll run through them fairly fast. 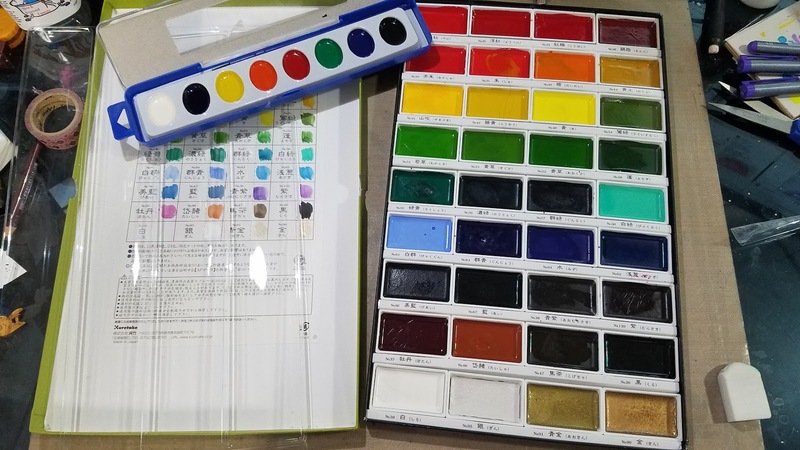 Like with Western watercolors, Gansai watercolors can be mixed thinly, and thus more transparent, or thickly, and thus more opaque. I would not classify gansai watercolors as being 'like gouache'. Kuretake Gansai Tambi paints seem to be a bit richer in color than the Yarka Student paints. 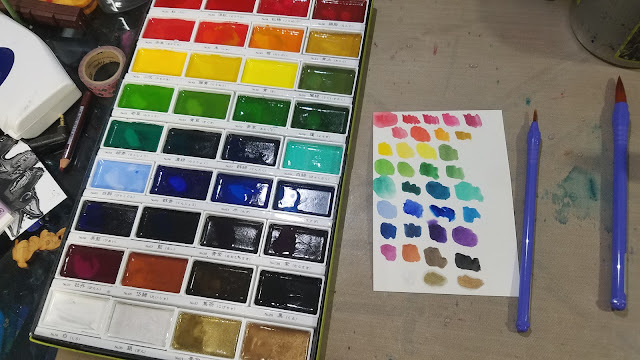 For a full review of the Yarka Student Semi Moist Watercolor set, keep an eye on my Youtube Channel. Kuretake's Gansai Tambi work exactly as intended, but that doesn't mean they'll work for every artist. Bold saturated color, generously large pans- these are great selling points. A lot of glycerin, frustrating to layer- these might be reasons you avoid Gambi Tansai watercolor for your Western illustration. 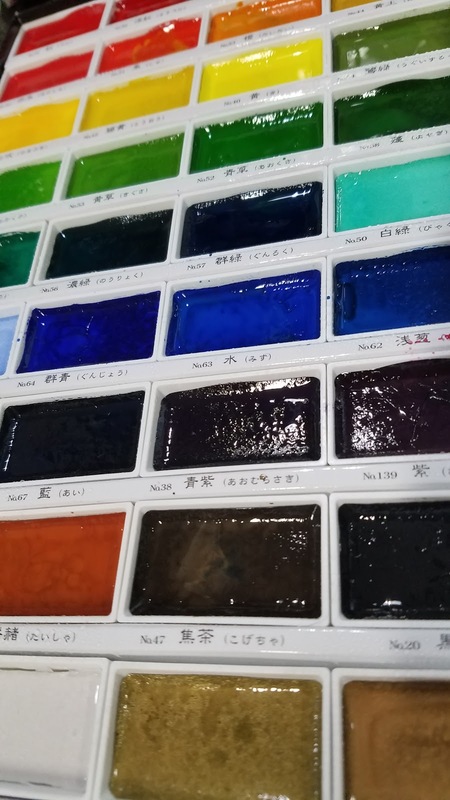 There are other Gansai watercolors on the market- Kisshou, Boku-Undo, and Akashiya are a few other options.